Every estate plan is unique, but many of the problems are all the same. The following estate planning mistakes can be disastrous for your future but are all easily avoidable with the proper help and planning. All you need is a little extra knowledge to make your estate plan go a long way. It’s important to remember your will doesn’t designate who receives all of your assets. Retirement accounts, life insurance, and annuities need separate beneficiary designation forms. If you don’t update these forms, your assets may transfer over to another family member, from parents to children and possibly an ex-spouse, even if they don’t know how to manage the asset. You are able to make annual gifts of up to $15,000 per donee and those gifts will not be included in your estate for estate tax purposes nor considered a gift for gift tax purposes. If you are married, you and your spouse can make a gift of up to $30,000 per donee and get the same results. Furthermore, in 2019, every individual has a lifetime gift and estate tax exclusion amount of $11.4 million. However, in 2026, that exclusion amount will be reduced to $5 million (indexed to inflation). Accordingly, if you have a large estate that exceeds the estate tax exclusion amount, you will want to make lifetime gifts either outright to your children or into trusts for their benefit before the amount is reduced in 2026. Because the current Federal estate tax rate is 40%, this represents a potential savings of more than $2 million. In the event you are incapacitated and no longer able to make financial and health related decisions, you will need a health care proxy or the durable power of attorney to ensure all of those decisions are handled with care. There are several options to utilize, including a nonspringing power of attorney or a springing power of attorney. You should contact your estate planning lawyer to discuss which option is best for your directives. If you do not have documents appointing these powers, the state and local laws will determine who can make both financial and health care decisions. 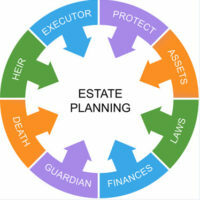 Estate planning is a long-term, complicated, and rather costly process. In the end, all of that time and money is worth it to make sure your loved ones are secured well into the future. However, many people will DIY their estate by using a self-help website to make generic wills and trusts without the help of an experienced estate planning professional. Skipping over even the smallest of details such as gender pronouns, has the ability to throw your estate into chaos. You need to consult an estate planning attorney to determine how your retirement accounts, funds, assets, intellectual property, and even your pets should be documented to reflect your estate planning wishes. This is by far the most important part of your estate. If you die without a will, otherwise known as intestate, Florida state laws will pass your estate on to your living relatives, regardless of what you may have wanted. This can cause a lot of headaches for your family, who may spend extra funds on litigation and proving their relationship to you when it all could have been avoided by curating a will. You should always be updating your wills and living trusts based on marriages, divorces, births, deaths, and asset control. A good rule of thumb is to examine your plan every 5 to 7 years as well. In order to avoid these estate planning disasters, contact the St. Petersburg estate planning attorneys at Legacy Protection Lawyers, LLP. We can answer all of your most pressing estate planning questions and make sure every detail is in line for your estate’s success. Call our St. Petersburg offices today to start your plan, at 727-471-5868. You can also contact us online to schedule a consultation today.